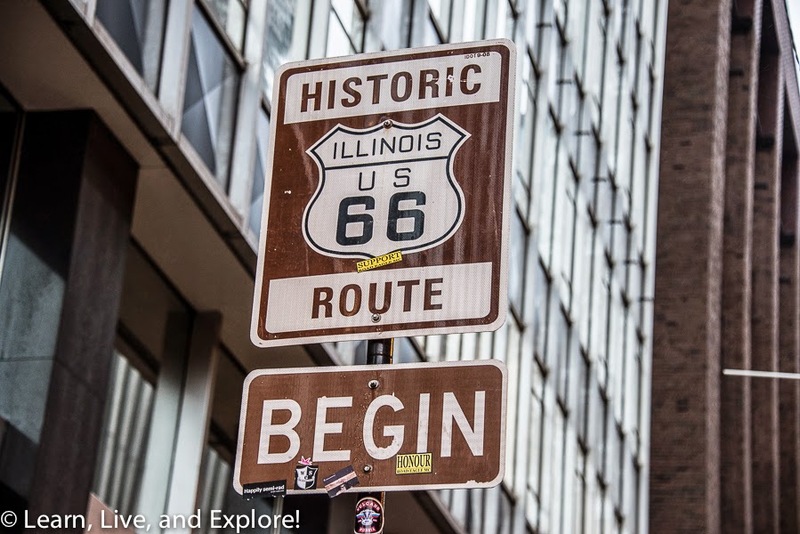 Route 66 Kicks: Day 1....Chicago to Joplin ~ Learn, Live, and Explore! 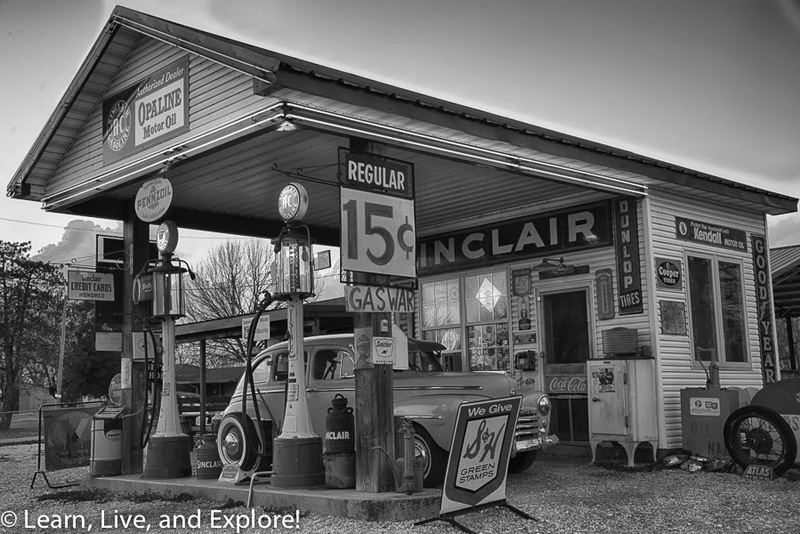 If you enjoy road trips, then I know Route 66 is on your bucket list. 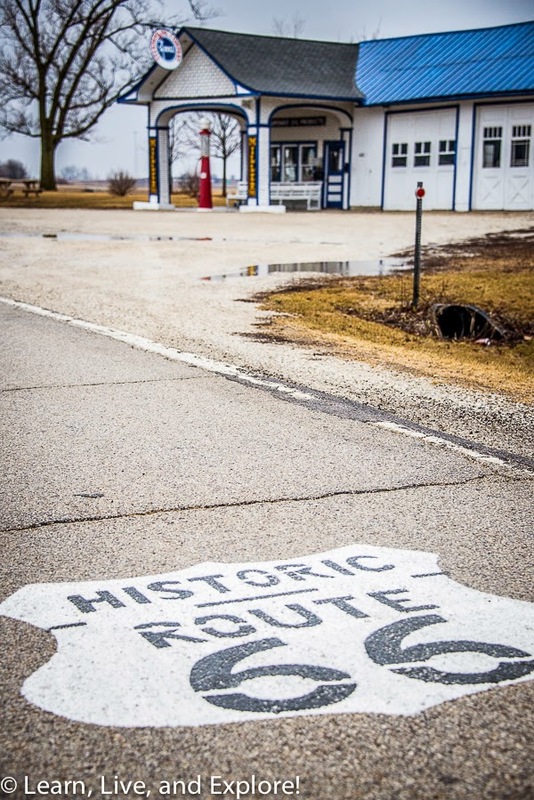 As summertime reminds me of some of my favorite road trips, I decided I wanted to reminisce about the time I checked my own Route 66 box. What better time to talk about the "Mother Road" and making a journey across the U.S. than over the July 4th weekend, when everyone is celebrating America. I have so many photos from that trip, I am going to break it up by the four legs of the drive over the next four days: Chicago to Joplin, Joplin to Tucumcari, Tucumcari to Flagstaff, and Flagstaff to Santa Monica. I hope you enjoy sharing the journey with me! As you drive south on Michigan Avenue, when you reach the Art Institute of Chicago, hang a left on E. Adams Street. On the left side of the road, in front of the Panda Express, blink and you might miss the starting point of Route 66. This isn't the original starting point. 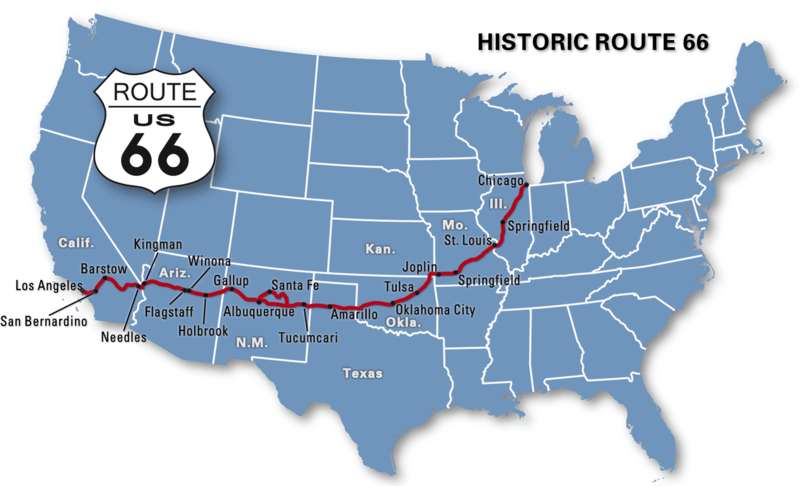 In fact, it's not even the official start of Route 66 at all! The actual start is E. Jackson Drive and Lake Shore Drive; however, since you need to head west and Jackson is a one-way eastbound street, perhaps that is why the misleading sign is now on Adams. Speaking of Jackson, 565 W. Jackson Blvd. 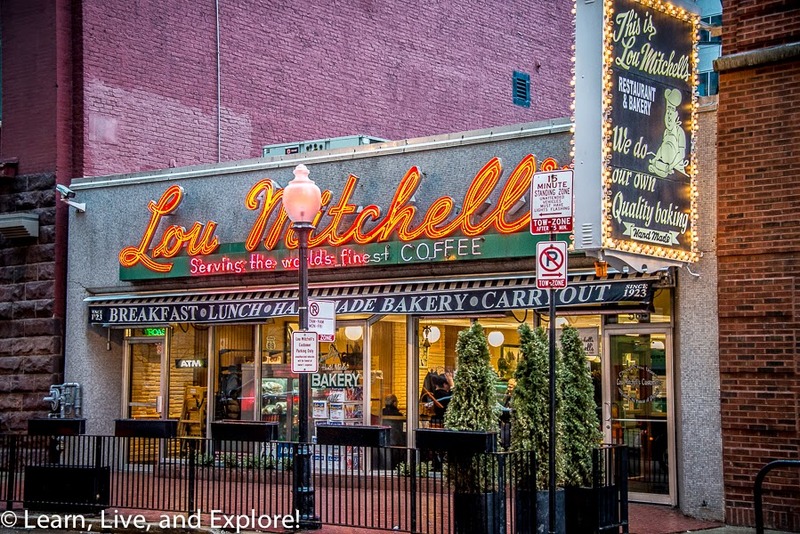 specifically, Lou Mitchell's restaurant has been feeding hungry Route 66 travelers since the beginning, in 1926. Not surprisingly, the diner is nicknamed the "first stop on the Mother Road." 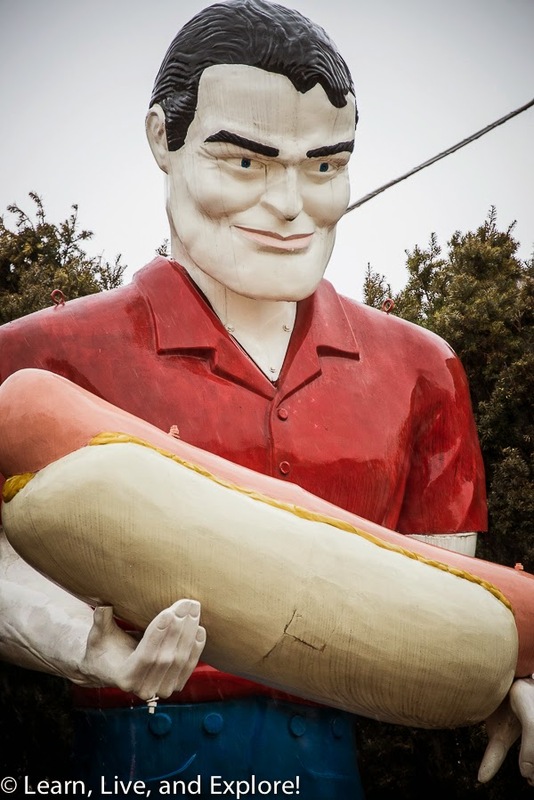 Located at the former Launching Pad Drive-In at 810 E. Baltimore Street, this is one of several "giants" on Route 66 and is also known as one of the famous "muffler men." The giant was created from a standard mould for decorative advertising sculptures. Each giant can be personalized for the business or at the whim of the buyer. You can see how the arms are in an "L" shape to make it more conducive to holding objects, and the hands are turned in opposite directions to allow for a flag or stick to be inserted. 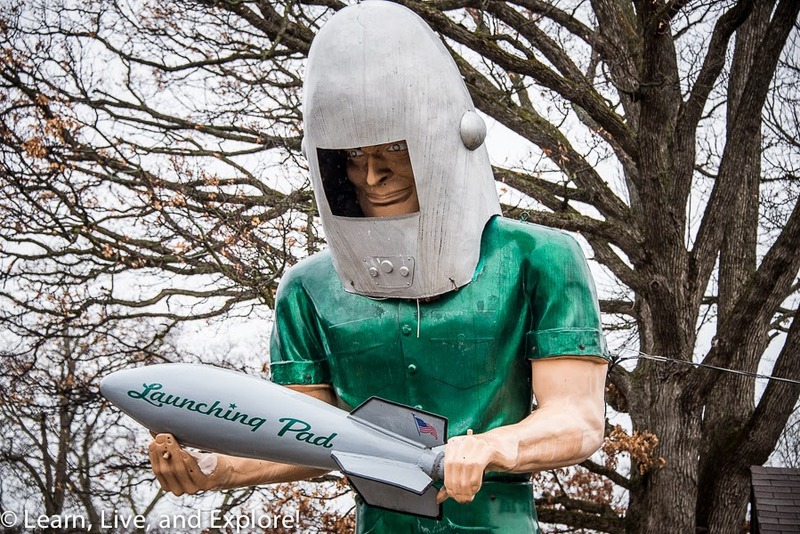 This Gemini Giant is one of three muffler men on Route 66, all in Illinois. I have have photos of two out of the three. There's another one in Flagstaff, but it's not the same design. They're kind of scary looking, if you ask me! 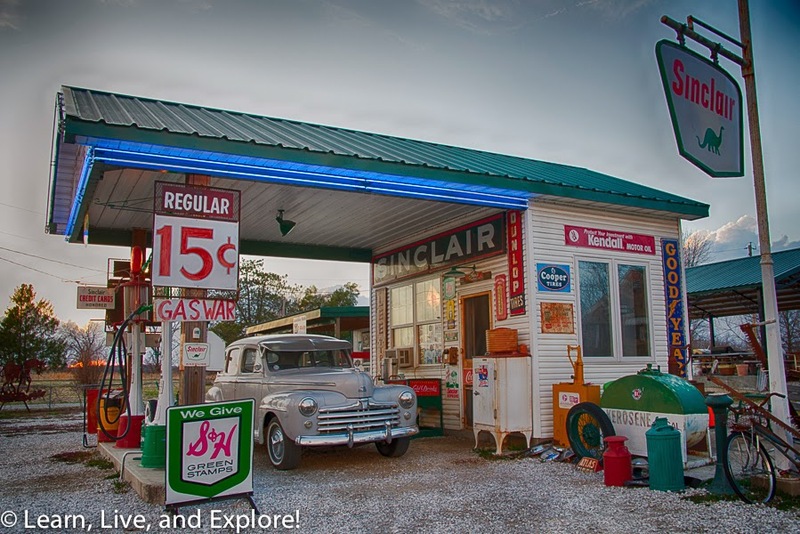 This is the first vintage gas station on my Day 1 schedule, and what a great one! 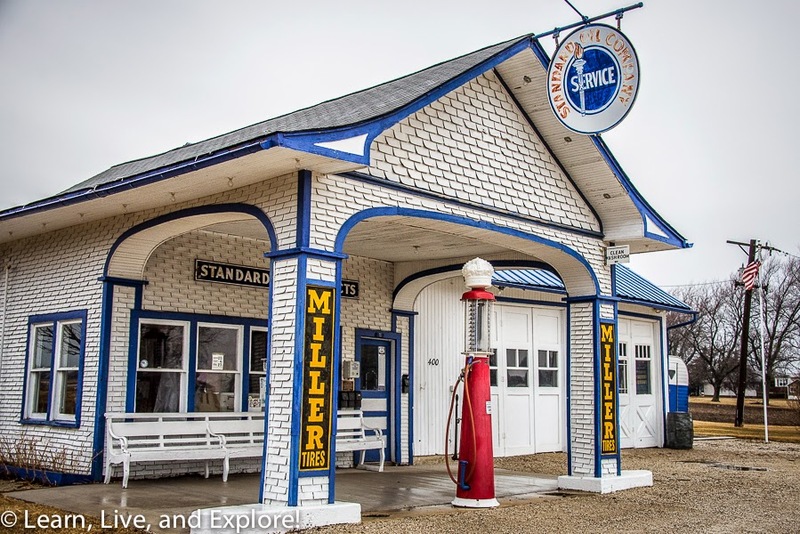 Located at 400 S. West Street in Odell, this 1932 Standard Oil gas station has the old signage and restored gas pumps. "Tall Paul" was not original to Route 66, having been moved from Bunyon's Hot Dog in Cicero near Chicago when it closed in 2003. 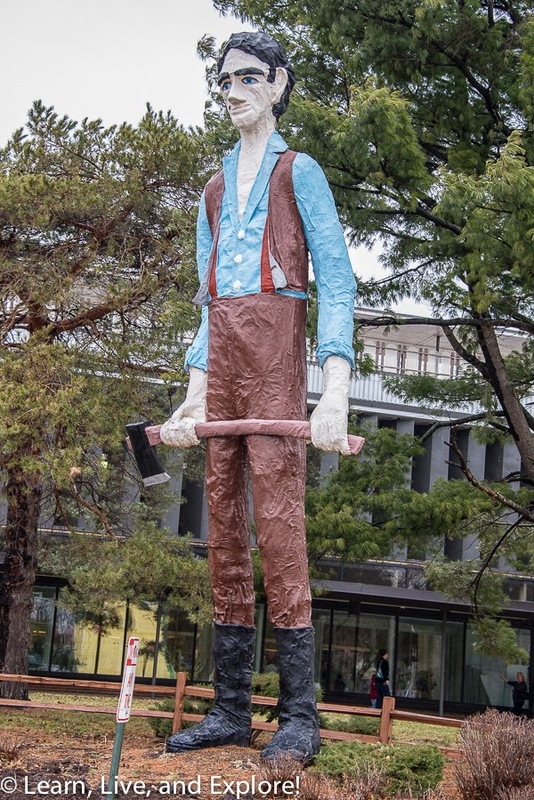 So, while he looks like Paul Bunyan the lumberjack, the actual name of this muffler man is not a misspelling. 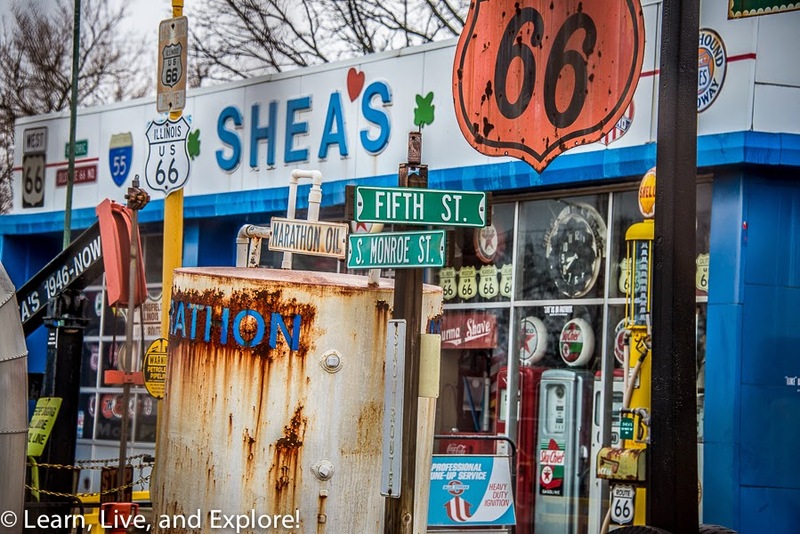 Located at 2075 N. Peoria Rd., Shea's gas station's owner is a curator of Route 66 gas station memorabilia. 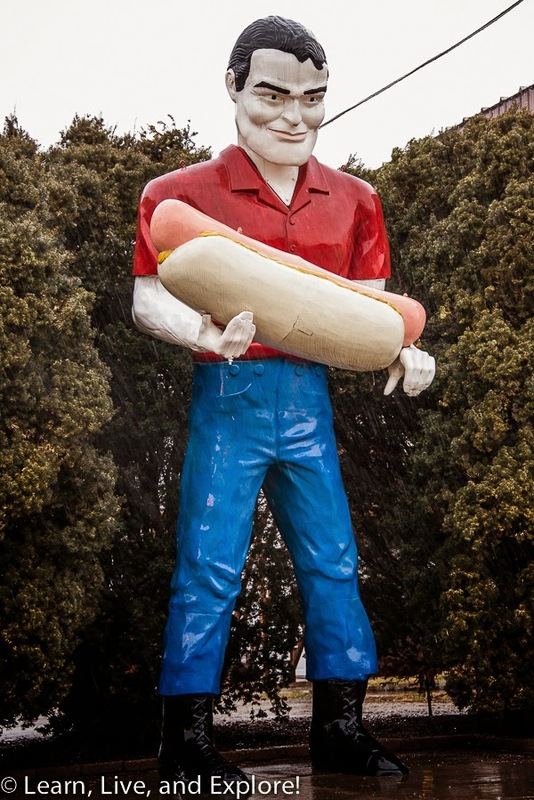 Nearby on the Illinois State Fairgrounds is another giant worth mentioning, though it is not a muffler man nor original to Route 66. Still, any giant is a worthwhile giant, and since Illinois is the "land of Lincoln," this giant is one of Lincoln as a young man. I love corn dogs! 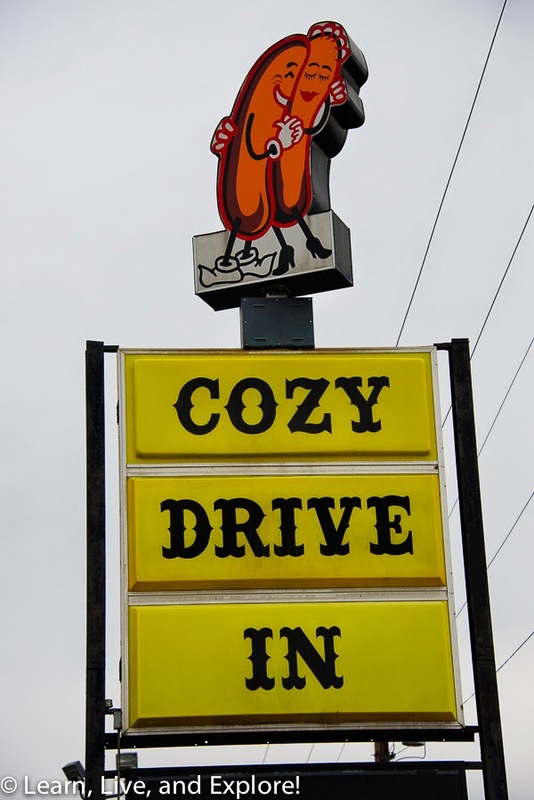 Alas, even though a cozy dog is essentially a modern day corn dog, don't head to the Cozy Dog Drive-In, at 2935 S. 6th Street, expecting them to respond to an order for a corn dog. This restaurant was established in 1946, and has been serving Route 66's fried cornbread wrapped hot dogs since the beginning. 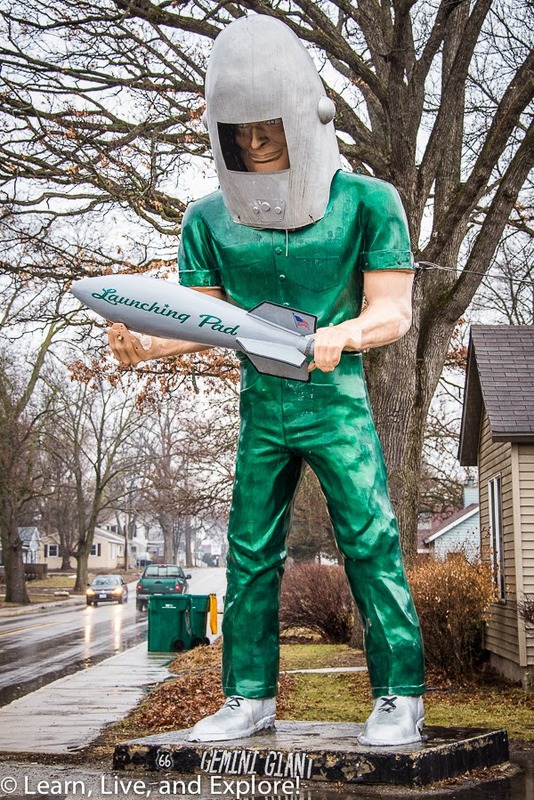 Nearby, head to the Lauterbach Tire at 1569 Wabash Avenue to see the third muffler man giant in Illinois. I read that his head was blown off by a tornado, but fortunately it was reattached. That would be awkward if it had not been fixed! 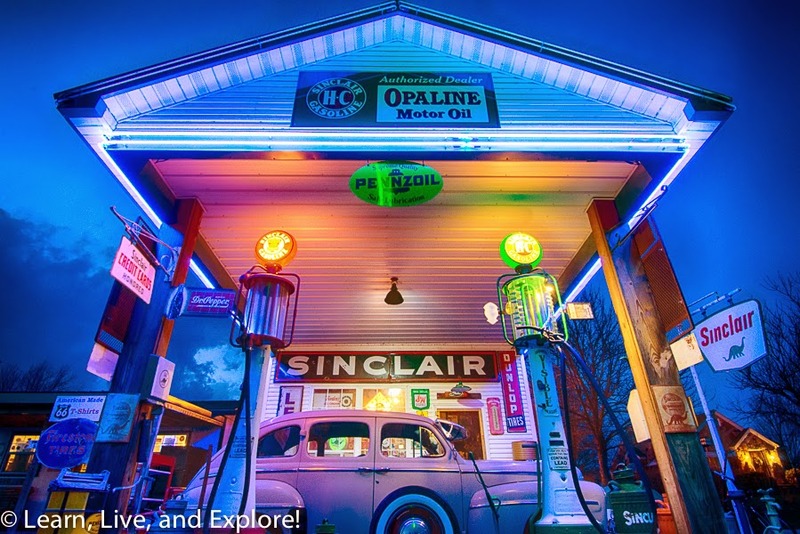 Here is another fantastically restored gas station in Illinois. Make sure that this one gets on your list of stops if you are traveling the Mother Road in the future! It's at 102 S. Route 66. 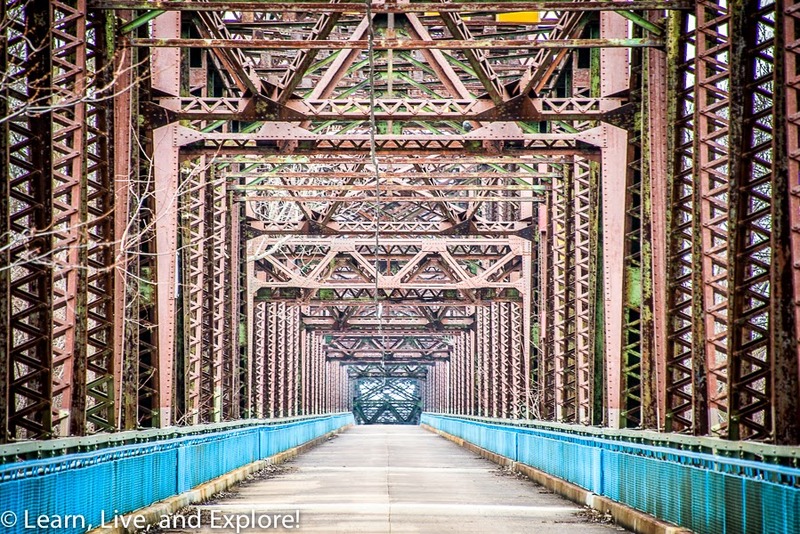 There is so much to do in St. Louis, but with limited time, I opted to skip the most famous attraction, the St. Louis Arch, and headed to the Chain of Rocks Bridge. This photo was taken from the east entrance to the, now pedestrian only, bridge. I've read that there are theft problems in the bridge parking lots, but that may be more on the west entrance. I would say to take precautions, regardless. While I like this photo, it is missing the bridge's unique feature: partway through, the bridge actually is built with a dogleg kink in it. 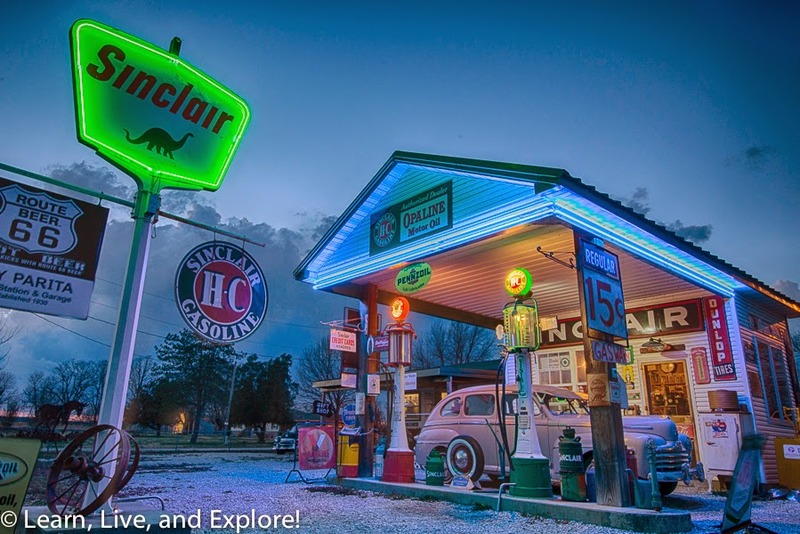 Route 66 is all about restaurants, gas stations, giants, and vintage motels. 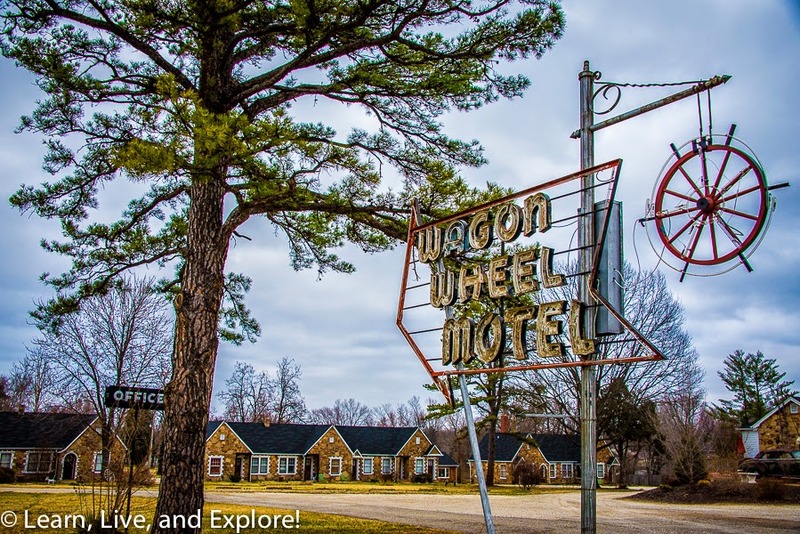 At 901 E. Washington Blvd., the Wagon Wheel Motel was established in 1934. It is a great example of the motor inns that were a staple on the iconic cross country route. It also is the first of many neon signs I encountered on this road trip. 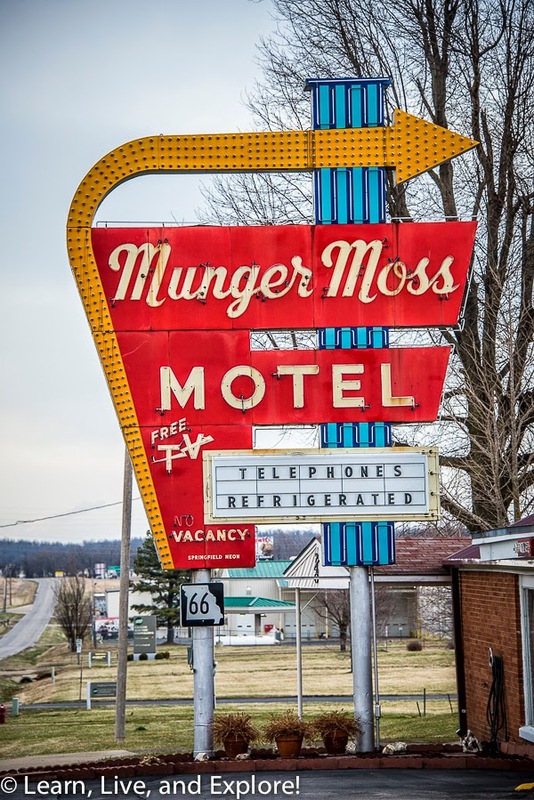 Speaking of neon signs and motels, the one at Munger Moss at 1336 Hwy 66, makes me want to seek out a jukebox and play some of my favorite hits from the 1950s! 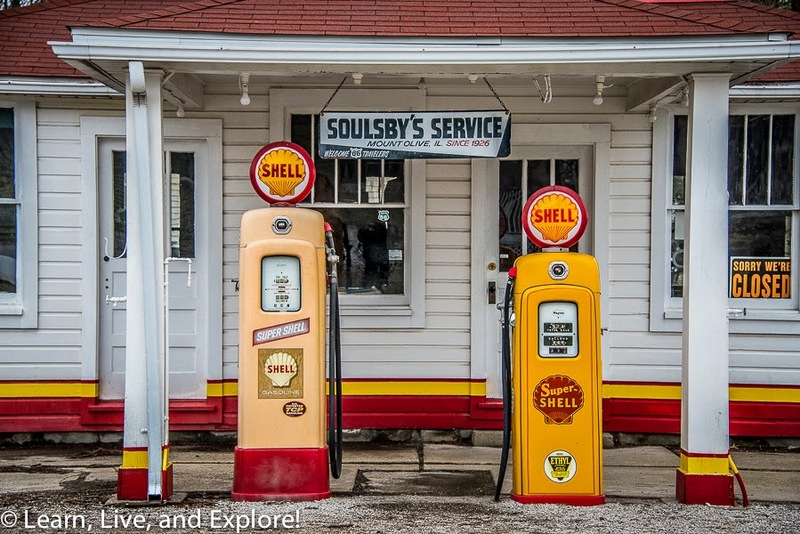 The last stop on Day 1 of the Route 66 trip was my favorite stop over the entire four day journey. It's a little hard to get to, but if you take exit 57 off of I-44 to State Road 266, exit and take a left at the T intersection. It's just down the road on the right. 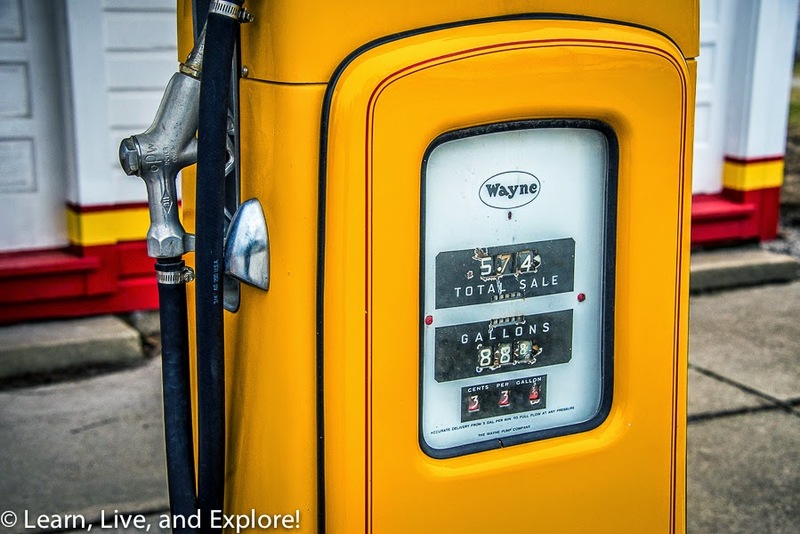 I had read about this gas station before departing on my trip. 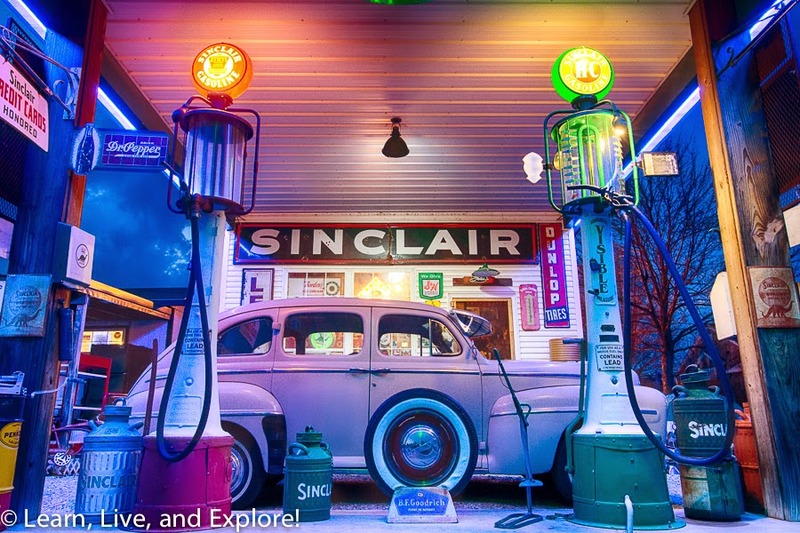 Some of the photos I had seen were fantastic because of the neon accent lighting and the perfectly set up "gas station scene." The owner, Gary Turner, is the nicest person. I talked to him extensively for hours, as I was the only visitor at the time and as a huge thunderstorm was passing through making it dangerous to drive. 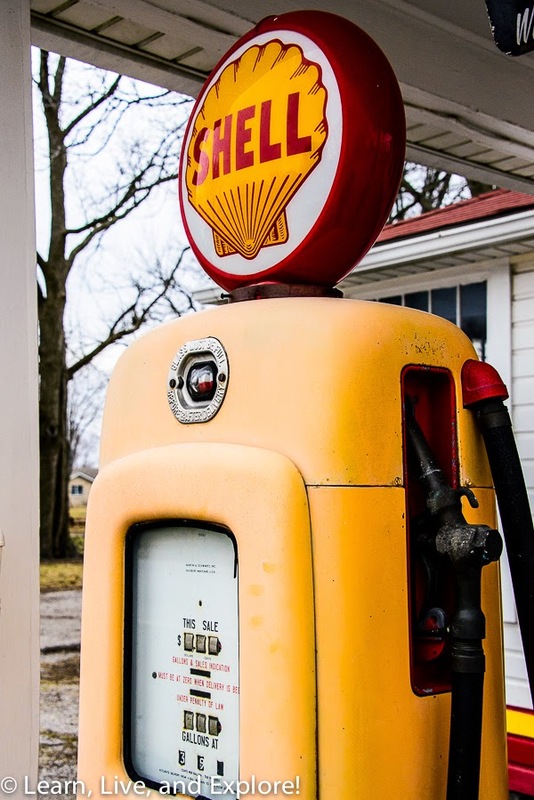 We talked about his life in Missouri, his participation in the restoration of Route 66, and all of the visitors he has encountered over the many years of owning the gas station. He scolded me about how quickly I was driving through the sites, making me feel guilty enough to think I may have to do a repeat drive sometime in the future, so I can not only see the sites but meet the people. The photos I took of Gary's Gay Parita are some of my absolute favorites! I have some of them framed in my house. I love the colors, I love the compositions, I love the thunderstorm clouds in the background that remind me specifically of that day. Once the storm passed, it ended up being too dark to take a good photo of the 66 Drive-In Theater in Carthage, Missouri, the last item on my Day 1 list. 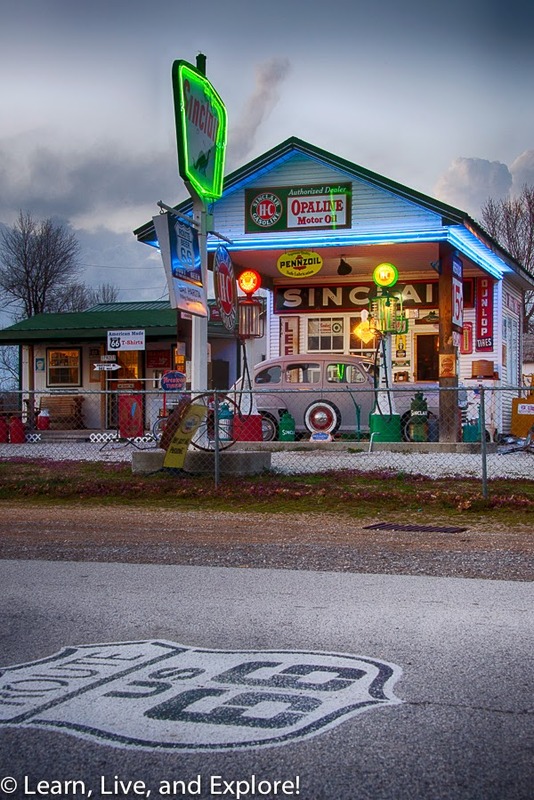 This Drive-In, established in 1949, is a classic restored original Route 66 stop. After a long day, it was time to find a bed to sleep on in Joplin to get a good night's sleep before making the drive through four states to New Mexico (yes, Kansas counts even if it's only a sliver of the southeast corner.